I just turned the TV on to hear a guest say about Trump “he needs to study better.” As if this is normal. As if? As if! The rumor mill has it that Trump has been dissatisfied with Sean Spicer for some time, but has really grown tired of his press secretary being mocked by Melissa McCarthy on Saturday Nite Live. On of the names that has been leaked for his replacement is Fox’s co-host on The Five, Kimberly Guilfoyle. She certainly “appears” to be qualified. Aside from her glamorous looks, the 48 year old graduated from the University of San Francisco School of Law and was married to progressive Gavin Newsome who was mayor of San Francisco and now the Lt. Gov. of California from 2001-2006. She also modeled for local department stores, including Macy's, and modeled for Victoria’s Secret. She worked as a lawyer. You can read her profile here. With her Trump may get more than he bargained for. She might take the job, the likely paycut and not turn out to be a toady. 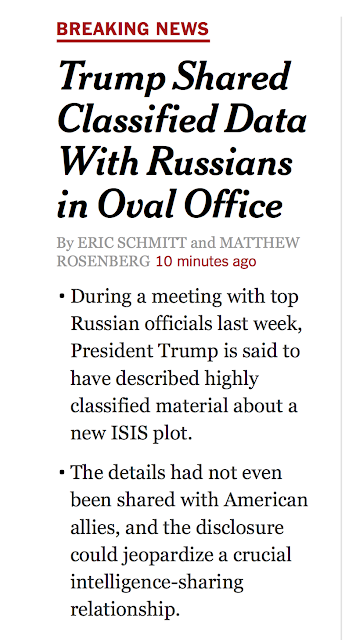 If this is true, and I think it probably is, aside from Putin ordering advisories and critics murdered, this makes Trump look like a choir boy. Afternoon (but don’t miss the John Gartner OpEd in today’s NY Daily News!) This is the easiest, most straightforward, explanation of Trump’s dangerous malignant narcissism. It is by the founder of the Duty to Warn movement which is now over a year old. Thank you, Kellyanne Conway. On Thursday on Fox News, the President’s most polished defender told America the truth about why Donald Trump fired James Comey: Trump “expects people who are serving in his administration to be loyal to the country and to be loyal to the administration.” And he sees no distinction between the two. What if that bomb was in the White House and its name was Donald Trump? 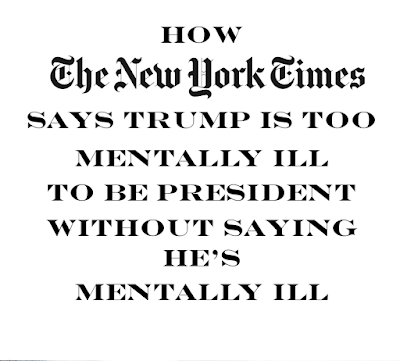 Mental health professionals have the skills, experience and training to evaluate both the sanity and dangerousness of this unprecedented President. 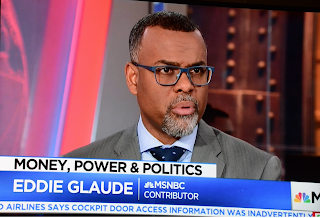 Above, I meant “Make our day"
I’m awake, damnit.. 3:00 AM and I turn on the TV to catch the start of Morning Joe for the first time since I move to Oregon…. and Mika and Joe and all the guests are livid about Trump - about the lies from Spicer, Huckabee-Sanders, KellyAnne and Pence, and at Trump himself for just about everything, even calling him a dictator who has no idea about how to be a dictator. They agreed that today began the unraveling of the Trump presidency. Joe: Donald Trump is not well, he doesn’t know what reality is, AND CHECK THIS OUT from Donnie Deutsh “we have to get past this Goldwater thing where psychiatrists don’t diagnose"
Update: Been an hour, Morning Joe show discussion is amazing this morning - when I was up just before three I realized I could watch it as it came on and see what was happening on the east coast. 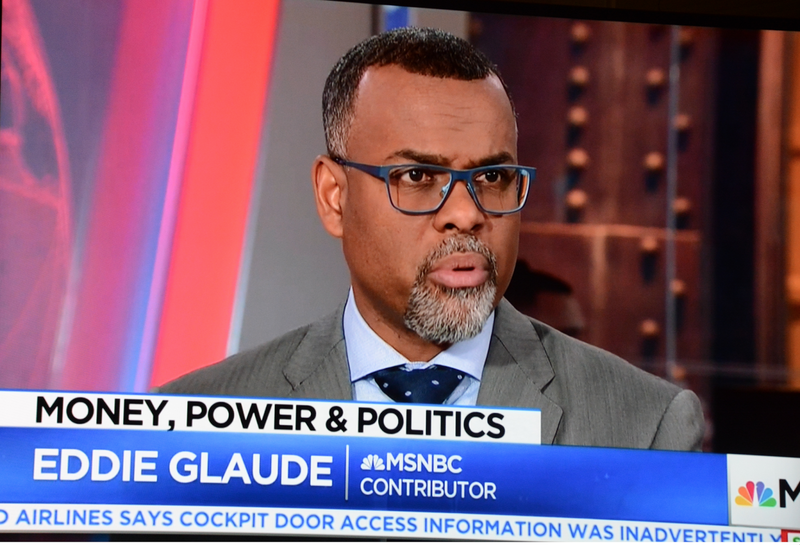 My mistake… they jumped right into the narrative vehemently blasting Trump and his inept lying lackeys in the harshest terms I’ve ever heard from this usually mild crew. Gene Robinson now on saying “when have you seen a cover-up without a crime. This is the worst case scenario - he is as bad as you thought he might be. UPDATE: Shortly after 6 a.m. on MSNBC’s Morning Joe program, cohost Mika Brzezinski, doing her best impression of Kate McKinnon, decided to lecture her cable news rivals about their frequent bookings of senior presidential adviser Kellyanne Conway. 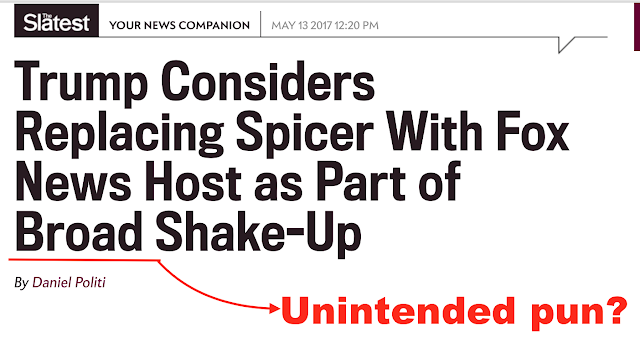 …..“First of all, Kellyanne Conway, Sarah Huckabee, Sean Spicer, Mike Pence—now all in the same category. In the Kellyanne category. 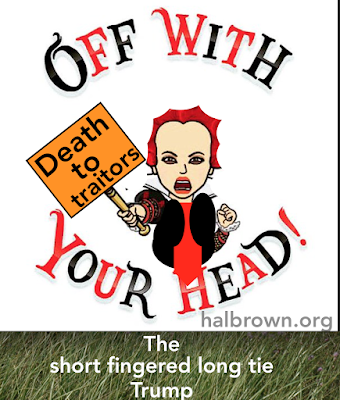 Not credible, proved as a liar, made a fool,” Brzezinski began her broadside as her fiancé/cohost Joe Scarborough listened from a remote location miles away from the studio in 30 Rock. 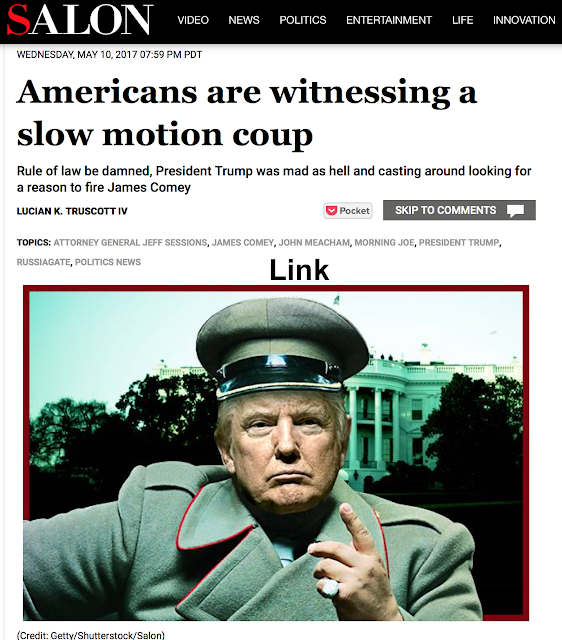 …..
Evening diversion - an English major reads between the lines of Comey’s goodby letter. 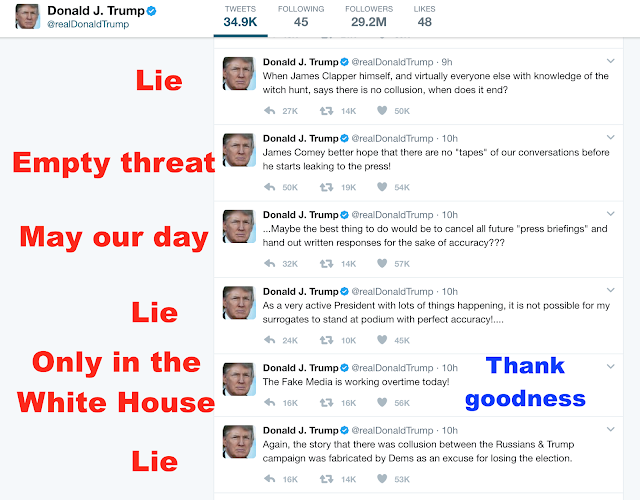 I give her an A.
Donald Trumps Admits He Was Looking For An Excuse To Fire James Comey Preview from the Lester Holt interview. “I was going to fire him regardless of recommendation,” he said. In an interview with Lester Holt, Trump called Comey a “showboat” and a “grandstander.” Trump said the FBI had been “in turmoil” for more than a year and hadn’t recovered. The president revealed he’d made up his mind to fire Comey before he met with Attorney General Jeff Sessions and Rosenstein on Monday. “I was going to fire Comey, my decision,” Trump said. “I was going to fire Comey,” he repeated, adding that there was no good time to fire someone. They’re “furious,” but it’s not like they didn’t know the photographer was there. Comey’s firing, these political scientists say, fits a pattern that’s very common in democracies that collapse into authoritarianism in the modern era. It’s not that the elected leaders in these countries set out to become an authoritarian, per se. It’s that they care about their own power and security above all else, and do things to protect their own position that have the effect of removing democratic constraints on their power. 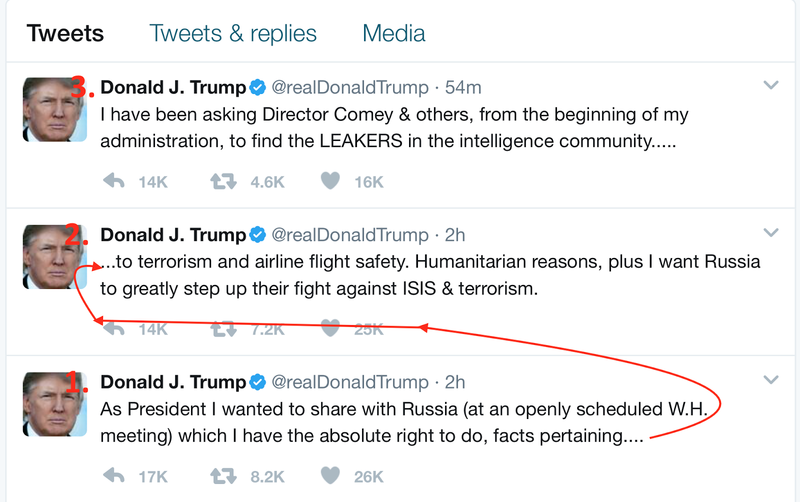 One of the first steps in this pattern is weakening independent sources of power that can check the executive’s actions. Like, say, the director of your domestic security service who just happens to be investigating your administration’s foreign ties. Rod Rosenstein may have chafed at the White House narrative that he was the driving force behind the firing. The DOJ is looking into Andrew McCabe’s role in the investigation of Hillary Clinton’s email server. 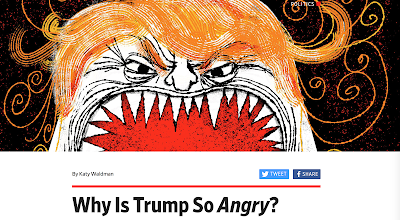 It is such an odd, ubiquitous detail—that Trump is “enraged.” He is apoplectic, incensed, irate, vexed, sore, peeved, tantrum-y, mad online, mad offline, mad in a boat, mad with a goat, mad in the rain, mad on a train. The president’s rage, his defining characteristic, is not of the contemporary political moment. It is something archaic, mythological, like the rage of Achilles. How can you be “enraged” about an investigation that has already found clear evidence of your team’s wrongdoing and yet that your allies have moved mountains to hinder? Why is it infuriating that the American people want to resolve the question of whether an authoritarian country meddled in their election? A man with nothing to hide would feel indignant, surely, but not this all-consuming rage; a man with secrets would presumably feel dread or guilt. But Trump’s wrath is not the response of a conventional politician. It is the lashing out of a mad king against the disobedience of his subjects. Breaking now: reported on Lawrence O’Donnell being reported in Washington Post-- Deputy Attorney General Rod J. Rosenstein threaten to resign when the recommendation to fire Comey was attributed to him. Below: Chris Hayes showed the photo taken by a Russian photographer explaining it “showed Trump yucking it up” with the Russians: UFB! (No American journalists were allowed in the meeting.) 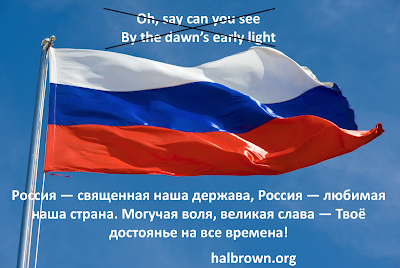 Read the Russian perspective on TASS. This is the delusional Donald. 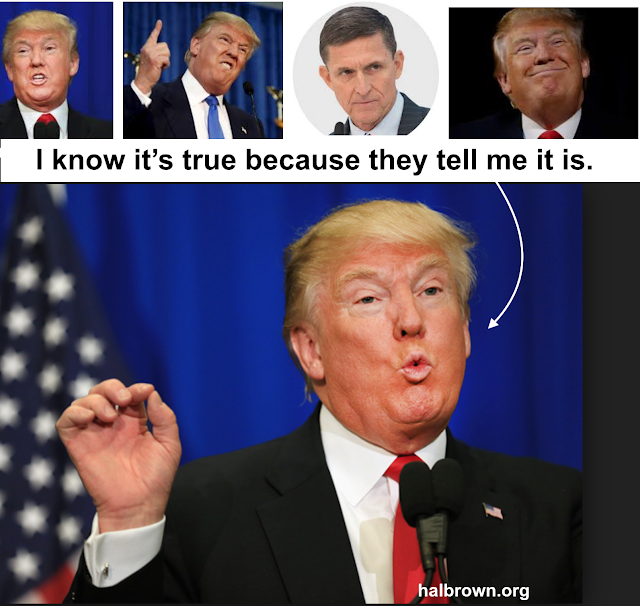 The other Donald is a sociopathic liar possibly approaching a mental breakdown (think Nixon) saying anything he and his cabal can come up with to lie their way out of the looming impeachment. 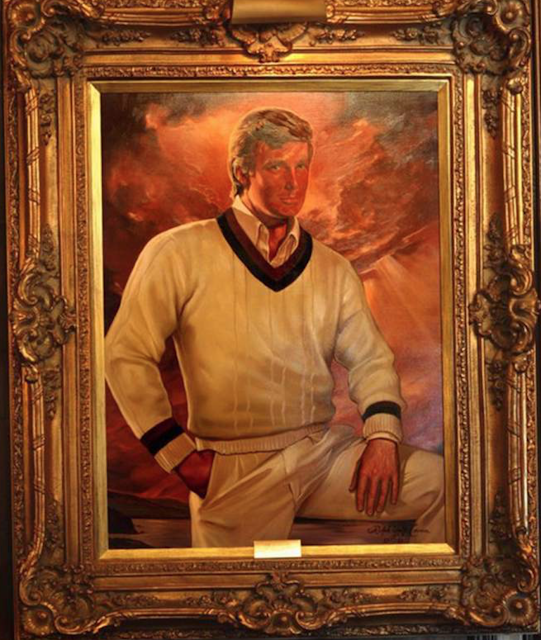 Primer: What is a malignant narcissist? All readers are invited to join this very active Facebook group. 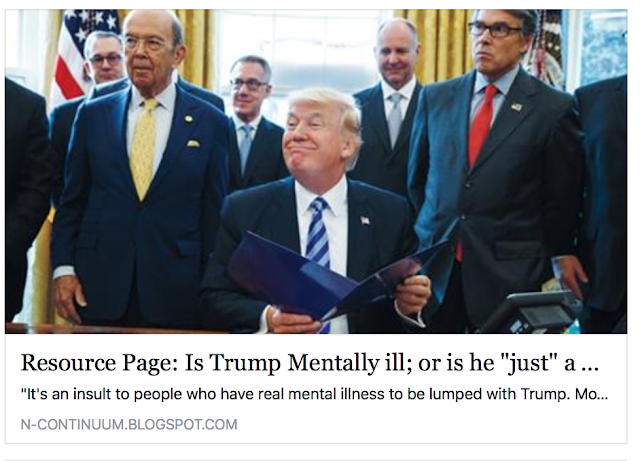 A society dedicated to the proposition that Donald Trump is too seriously mentally ill to competently discharge his duties as president and must be removed according to the 25th Amendment. 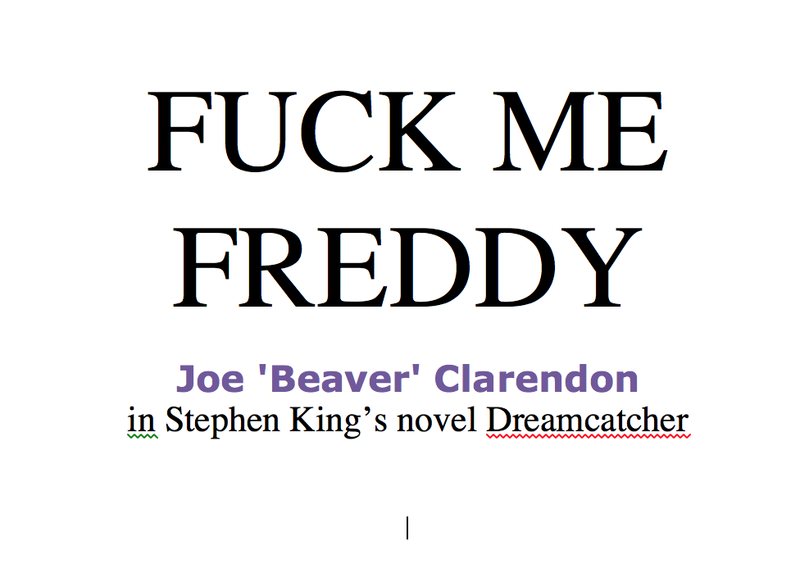 Read how John and I are now getting nasty Tweets. These are stories from before the Comey firing announcement. First read - Trump’s travel ban, creative bigotry: Segregation, back to 1971. My latest hate Tweet. Does the AMA shoot retired clinical social workers? The A.C.A. (Obamacare) had made a basic societal deal: The young, healthy and rich would subsidize access to insurance for the older, sicker and poorer. But this demanded that the former gave a damn about the latter, that people genuinely believed that saving lives was more important than saving money, that we weren’t living some Darwinian Hunger Games of health care where health and wealth march in lockstep. r those very same lives when they are in the world. What is the moral logic here? It is beyond me. Let’s cut to the quick: Access to affordable health care keeps people alive and healthy and keeps families solvent. Take that away, and people get sick, run up enormous, crippling debt and in the worst cases, die. It is really that simple. People may conveniently disassociate a vote cast in marbled halls from the body stretched out in a wooden box, but make no mistake: They are linked. 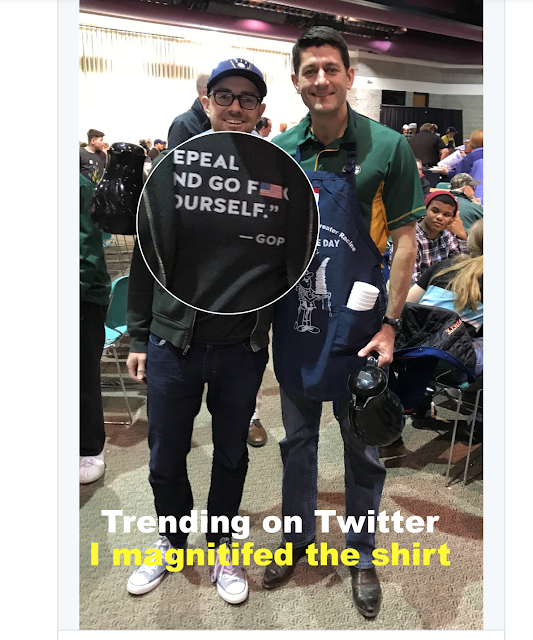 The T-shirt, which reads “‘Repeal and go f**k yourself.’ – GOP,” makes a pointed comment about House Republicans who voted to end health insurance for millions of Americans earlier this week. An American flag serves to censor the expletive on the shirt. This isn’t about Trump, but it really pissed me off more than merely reading about another anti-science decision because one of the advisors fired from the EPA science advisory board was from my alma mater, Michigan State. I don’t know him, but it’s interesting how even this slight connection makes it feel more egregious. 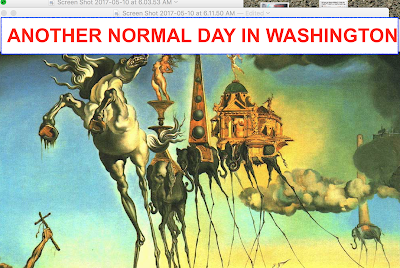 “Ideas don’t float in the air, they live in your neuro-circuitry,” Lakoff said. Each time ideas in our neural circuits are activated, they get stronger. And over time, complexes of neural circuits create a frame through which we view the world. 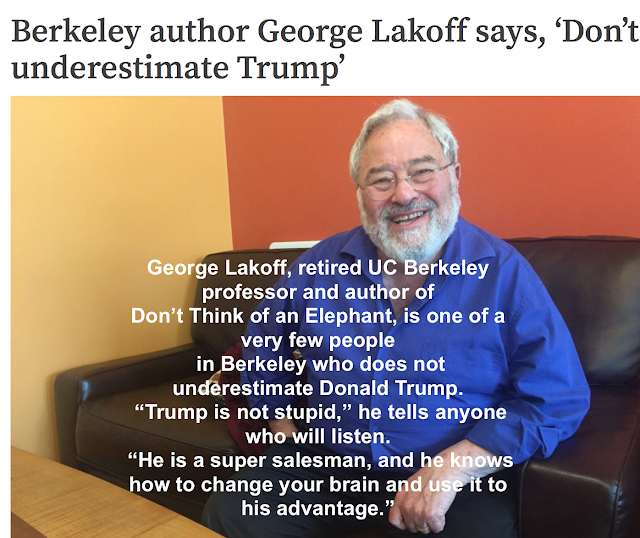 “The problem is, that frame is unconscious,” Lakoff said. “You aren’t aware of it because you don’t have access to your neural circuits.” So what happens when you hear facts that don’t fit in your worldview is that you can’t process them: you might ignore them, or reject or attack them, or literally not hear them. This is from Jan. 25th but it is being cited again. 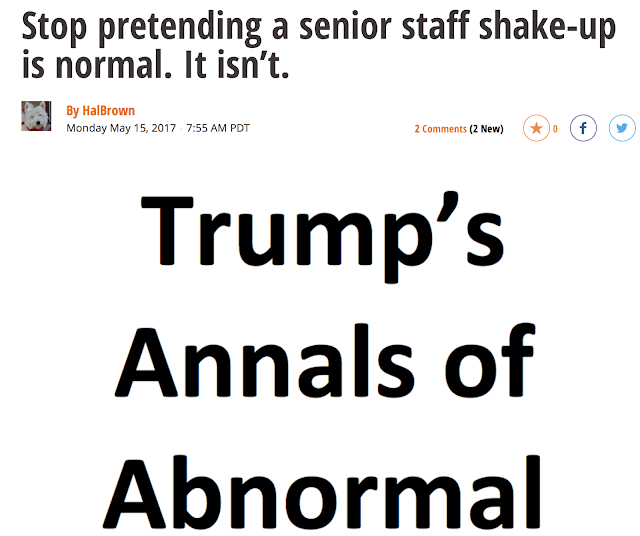 It is worth reading because it may be another reason Trump could be removed under the 25th Amendment: Prominent neurologist warns bout Trump’s cognitive impairment. I didn’t know this about what Bandy Lee faced at Yale. 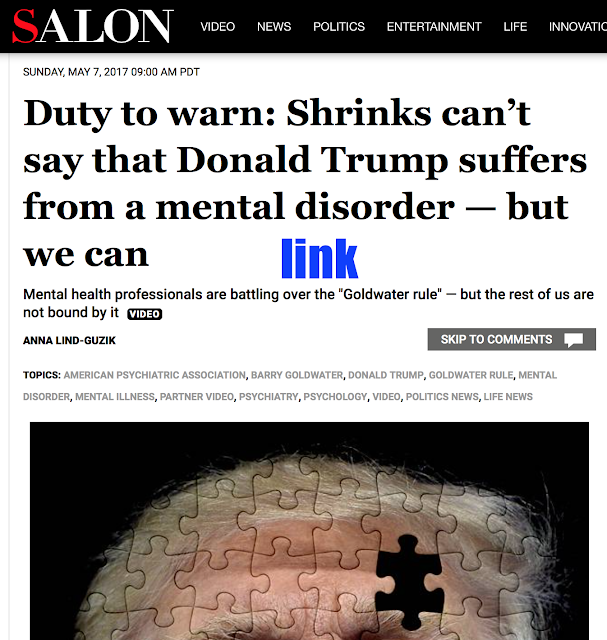 John Gartner joins her in taking a lot of hostility: Excerpt from Salon: The silence was broken last week by several renowned psychiatrists at a Duty to Warn conference organized by Dr. Bandy Lee. 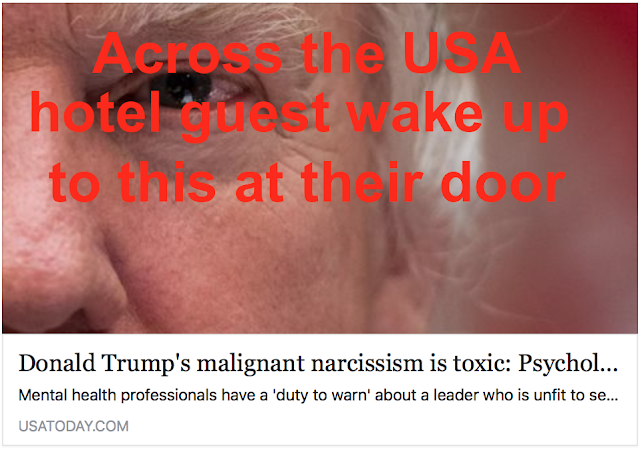 She has formed a coalition of more than 800 mental health professionals who believe that Donald Trump is dangerous to the health and safety of their patients. Dr. Lee is working in conjunction with Dr. John Gartner, whose online Duty to Warn petition has already accumulated more than 52,000 signatures from fellow mental health professionals. Though Lee’s town hall meeting was initially sponsored by Yale’s School of Medicine, Department of Psychiatry and School of Public Health, they all bailed out before the event, leaving Lee, a Korean-American woman, to run the conference alone. Despite the positive coverage of her conference, Lee told New York magazine that she has become a pariah in her department. This is not an accident: The academy and professional associations are old boy’s clubs that respond to challenges to their authority by circling the wagons. Duty to Warn makes Fox News! Update Sat. night: I just watched the show. It won’t make any converts considering the Fox audience. 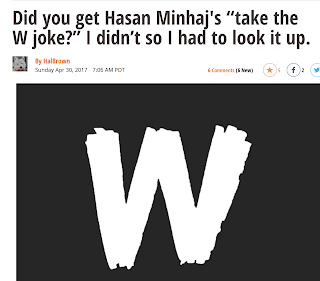 It wasn’t bad, although now that I see what Watters did I would have been more aggressive hitting back at him and not letting him get the last word. No time did Gartner say Trump was psychotic, though Watters kept using that word. Unfortunately he tried to rebut Gartner with his own lies. The examples of Trump's paranoia should have been irrefutable. 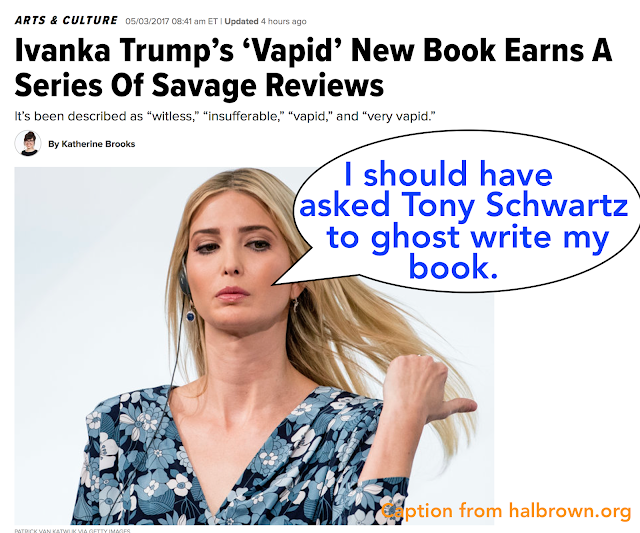 Asked t come up with sources who new Trump, a quote from Tony Schwartz would have been good. A few examples of his Tweets would have been effective too. 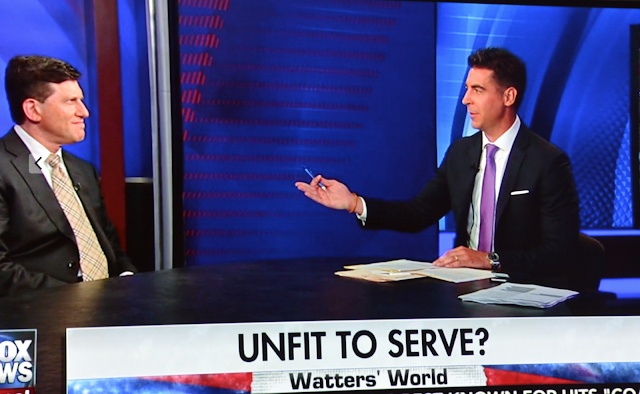 Watters' trying to say his craziness was merely playing politics should have had a powerful comeback. I would have perhaps said “you are smiling, smirking even now, but if I am correct (and thousands of psychologists think I am) you will eventually find that smile turned upside down. This would be more civil: I think there’s a way to level the playing field, but it would take a lot of work including rehearsing with a good actor playing the Fox host. It would of course mean reviewing a lot of previous interviews. Then developing a strategy, with flexible tactics to employ depending on how good the host is on counter-attacking. 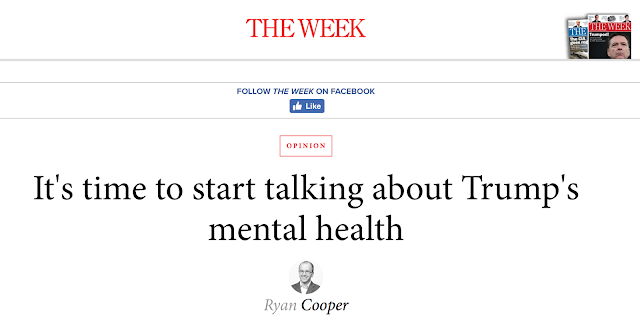 For example, one approach is to be paternalist and condescending, and refuse to answer some questions which are obvious attempts to bait the Duty to Warn therapist. Asked to provide examples of Tweets, for example, the could say that Trump’s unhinged Tweets have been discussed endlessly and his sycophants will always excuse them, while level headed observers will know that they come from an abnormal mind. A good way to parry the demand for examples is to say “I will not relitigate an issue that has been settled by the majority of nonpartisan fact checkers." As far as I know this is was first time a Duty to Warn therapist was on any Fox News show. 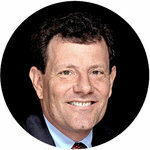 Dr. Gartner went to NYC and taped Fox’s Watter’s World show on Friday. He said it was highly negative, hostile, interruptive, and having just watched it I can say it was. I don’t think the video will be online for about a week. 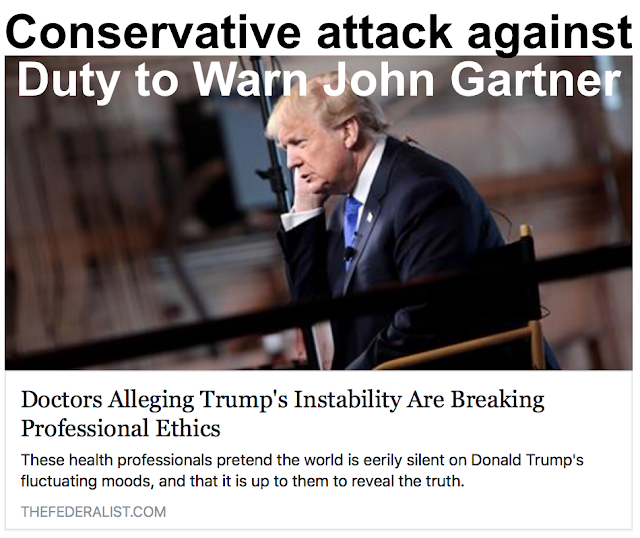 If you read this on a regular basis, you know that John Gartner was the first psychotherapist whose sound of the alarm a year ago led to domestic and international mainstream media attention. I got to know him after I was one of the first therapists to join his Duty to Warn movement, and for a year now we have been email friends. 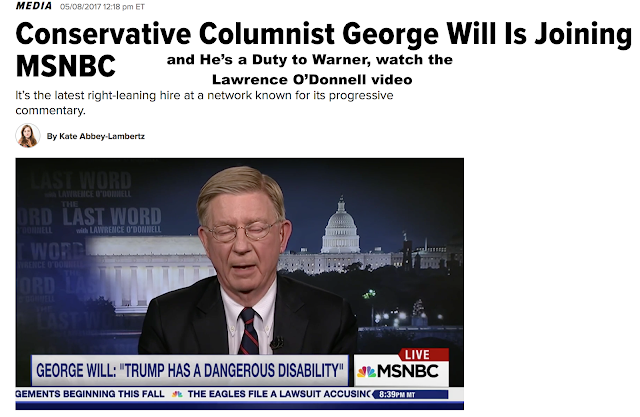 He’s been on Lawrence O’Donnell along with another Duty to Warn shrink, Harvard psychiatrist Lance Dodes. I am working with John and a number of mental health professionals on the planning for the “Keep America Sane” march in October. 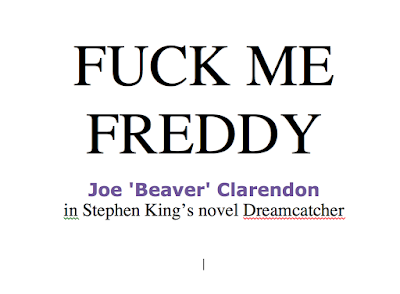 More about that later. I will be talking to John Sunday, so hopefully will have more to share with you. Quote: I think a good example is contained in that Politico piece I wrote about in my last post at PressThink, which is all about the supposed shocking irony, or astounding irony, that the same man who campaigns against the media and conducts hate speech against journalists as a class with regularity, is in fact hugely concerned with the news media and craves their attention, craves their approval. It’s not really surprising if you understand narcissistic personality disorder. Another way to say it would be, if you crave the approval of journalists — which Trump clearly does — it’s not such a great idea to call them disgusting people, dishonest people, the enemy of the American people. But if you understand narcissistic personality disorder, it makes perfect sense. A person that the medical health profession also calls a malignant narcissist — probably a better term — believes they are worthy of adulation by everyone, and when they don’t get it, their reaction is rage. 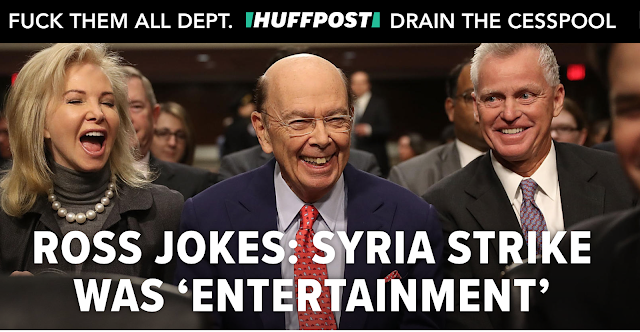 Thanks Breitbart for leaving no speculation about the expletive deleted by the mainstream media from Colbert’s Trump-Putin joke, and publishing his entire monologue. Jonathan Davidson in the journal Brain. In defining the boundaries, one of the more important questions may be to understand whether hubris syndrome is essentially the same as narcissistic personality disorder (NPD), a subtype of NPD or a separate entity. As shown in Table 1, 7 of the 14 possible defining symptoms are also among the criteria for NPD in DSM-IV, and two correspond to those for antisocial personality and histrionic personality disorders (APD and HPD, respectively) (American Psychiatric Association, 2000). The five remaining symptoms are unique, in the sense they have not been classified elsewhere: (v) conflation of self with the nation or organization; (vi) use of the royal ‘we’; (x) an unshakable belief that a higher court (history or God) will provide vindication; (xii) restlessness, recklessness and impulsiveness; and (xiii) moral rectitude that overrides practicalities, cost and outcome. WASHINGTON ― If you haven’t watched the floor of the U.S. House of Representatives during a big vote, you should. It’s instructive, and depressing. 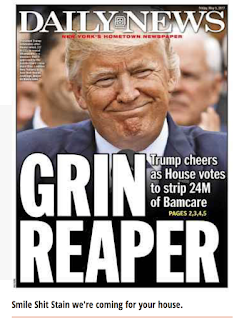 What you see ― what I saw from the press gallery on Thursday during the vote to replace Obamacare ― was the distilled essence of two vastly different Americas glowering and shouting at each other. There is no more vivid juxtaposition in American life today. On the Republican side: a phalanx of mostly white, mostly Christian, mostly men talking earnestly about liberty, freedom and unshackling business. Mental health professionals have been doing a lot of hand wringing since the election of Donald Trump. A cottage industry of mental health professionals has developed to opine on the behavior – described variously as unstable, grandiose, narcissistic, authoritarian — of the person now at the helm of the most powerful country on earth. 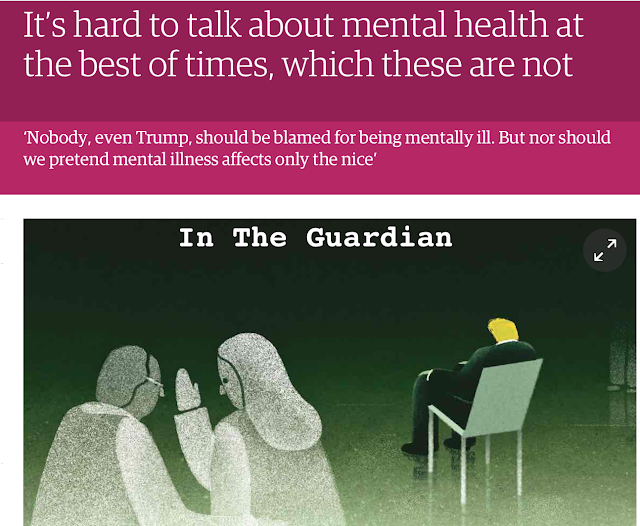 Still, a vibrant debate has emerged between mental health professionals on one side who consider it unethical at worst or irrelevant at best to diagnose or even characterize President Trump’s behavior and those on the other side who feel his behavior poses a clear and present danger of such magnitude that old rules no longer apply. The latter camp includes 25,000 mental health professionals (now double but not clear how many are mental health professionals, likely the first 10-20 thousand were) who were signatories to a petition by former Johns Hopkins psychologist John Gartner calling for the president’s removal from office based on his fitness to competently discharge his duties, a concern they believe is addressed in the 25th Amendment to the U.S. Constitution. > For most of the 20th century, organized psychoanalysis has sought to elevate its stature through a strategy of exclusion from its educational apparatus. Conversations like those that took place at a recent Yale University conference on what psychotherapists have the obligation to say about Donald Trump, make me think back about the University of Chicago effort and specifically about the value of engaging political scientists like Harold Lasswell. 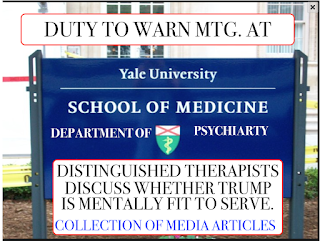 In our eagerness to assess how best to add a psychoanalytic voice to discussions about the capacity of the president to govern, we should take a step back and ask ourselves whether it is really the Goldwater Rule or our own historical reluctance to share our clinical perspective more freely with experts outside our clinical realm who are less encumbered than we are to offer this commentary. Robert Wallerstein, the one-time head of the America Psychoanalytic Association, noted just about a century after Freud’s only visit to the United States, that our field’s isolation from the university has exacted a high scientific price in terms of theory development and science. Its lack of inclusiveness has also exacted a high political price, perhaps higher than anyone might have anticipated. This is being organized by the Duty to Warn group started by Dr. John Gartner in late April a year ago. I was one of the first members. Excerpt: As president-elect, Trump did not know the pedigree and importance of the “one China” policy. About such things he can be, if he is willing to be, tutored. It is, however, too late to rectify this defect: He lacks what T. S. Eliot called a sense “not only of the pastness of the past, but of its presence.” His fathomless lack of interest in America’s path to the present and his limitless gullibility leave him susceptible to being blown about by gusts of factoids that cling like lint to a disorderly mind. A global coalition of former military leaders and diplomats who had responsibility over nuclear weapons is launching a "shadow security council" to offer advice to world leaders on how to reduce what they consider to be the growing danger of a nuclear conflict fueled by the rhetoric of President Donald Trump and destabilizing moves by Russian President Vladimir Putin. Monday was … strange. 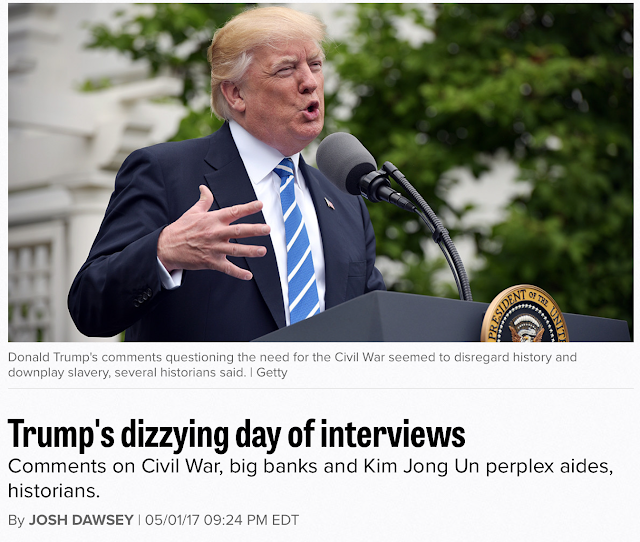 President Trump spent the day questioning the cause of the Civil War, doubling down on his praise of Andrew Jackson, claiming he would be "honored" to meet with North Korean dictator Kim Jong Un, admiring controversial Philippines President Rodrigo Duterte, disparaging the current iteration of his party's health-care bill, suggesting breaking up big banks, wobbling both ways on a gas tax, and abruptly walking out on an interview after a reporter pressed him on his renewed allegations of being wiretapped by former President Barack Obama. "He just seemed to go crazy today," one Republican aide told Politico. 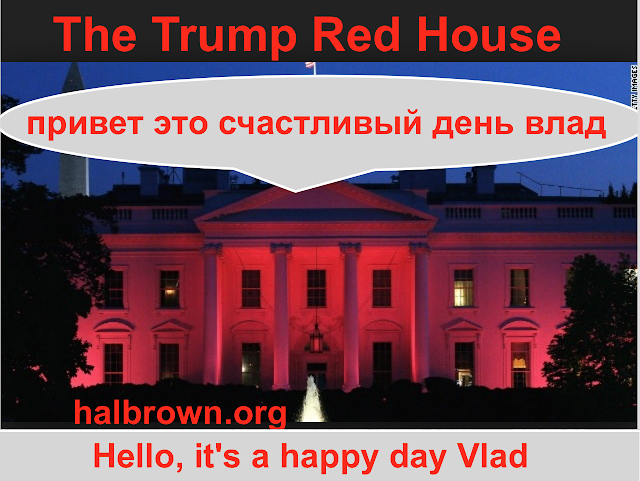 Link above: "It seems to be among the most bizarre recent 24 hours in American presidential history," said Douglas Brinkley, a presidential historian. 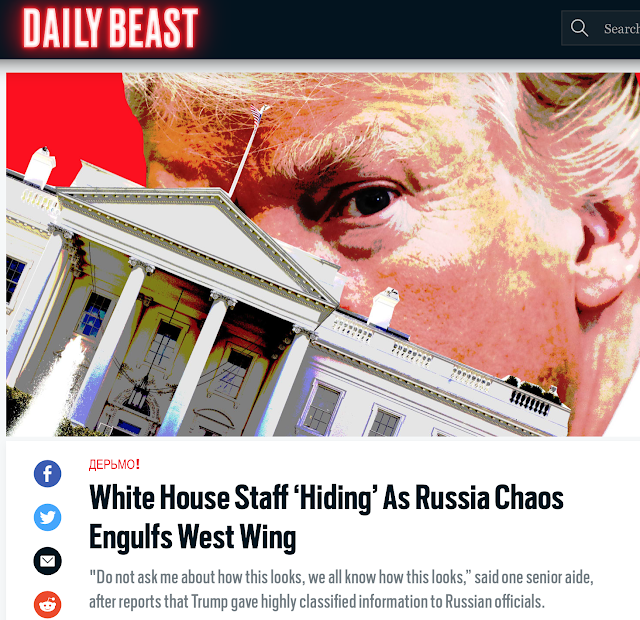 "It was all just surreal disarray and a confused mental state from the president." 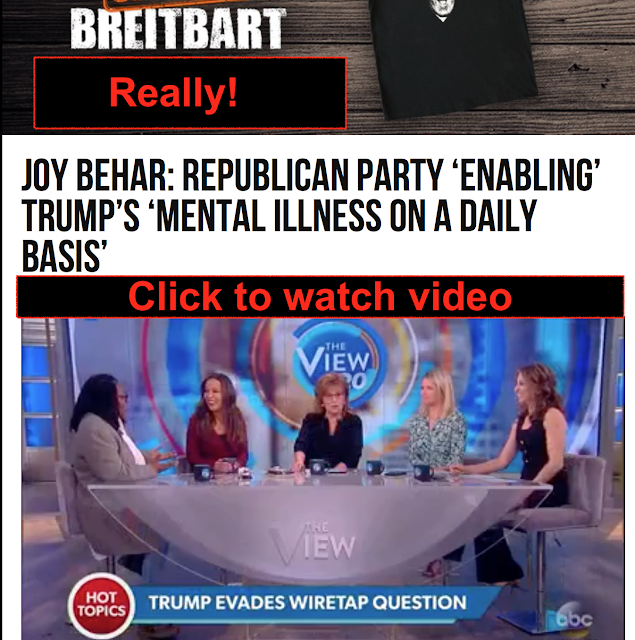 Even Joe Scarboro is coming around, Trump has a confused mental state! Have you heard of the Doomsday Plane? I was amazed to see this YouTube tour video. 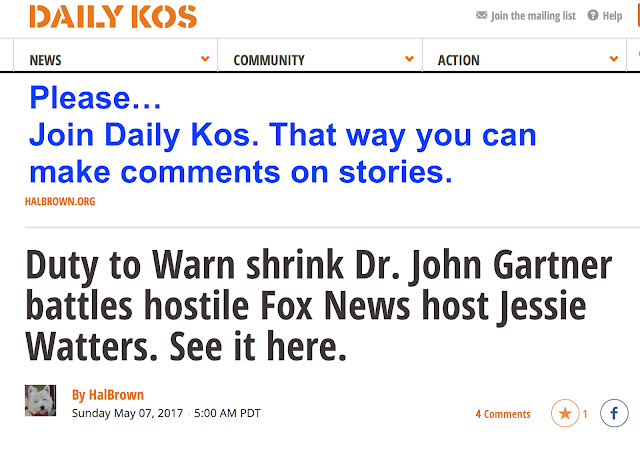 I put the Doomsday Plane story on Daily Kos, with a poll, it will be interesting to see what kind of comments it gets. For those of us who count on Rachel, Lawrence, Chris Hayes, and Joy-ann this was disturbing. 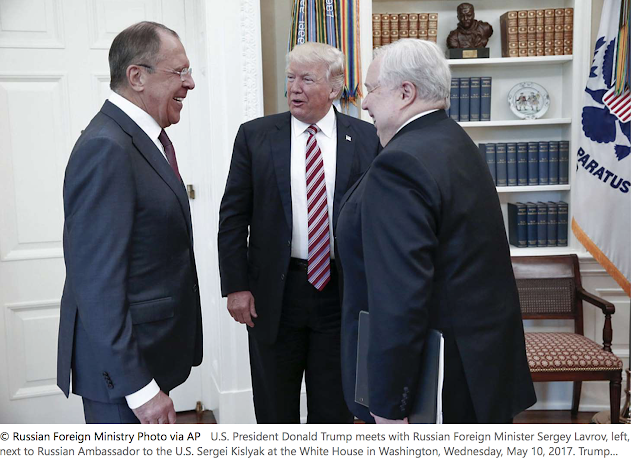 Look at how Trump averts his eyes with Dickersn (which is being replayed again and again - at least on MSNBC)… observe Trump’s body language. Of course Trump’s minions no doubt would have sent the persistent fake reported to the guillotine. What we saw is the tip of the narcissistic rage we know is always under the surface in this off the curve of a garden variety abnormal personality… Trump is the chapter that wasn’t in my 1960’s undergraduate psychology textbook, probably because the writers thought such an extreme disorder could only exist in fiction.. We need a Walter Cronkite to come out and say THIS IS NOT NORMAL. 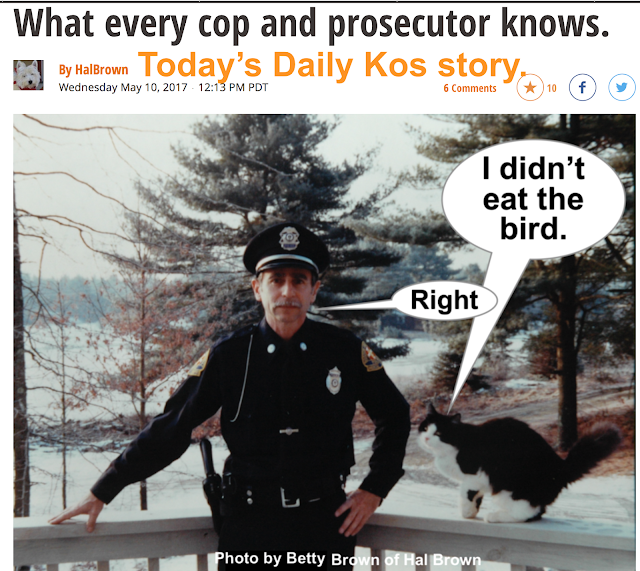 I put this story on Daily Kos where you can see if anybody comments. The anti-Trump forces have also coalesced quickly. 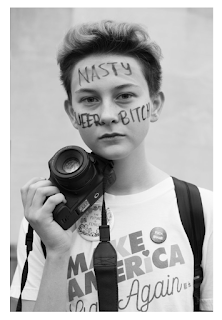 Groups that didn't exist six months ago have now become the center of a left-wing activist machine. The Women's March, which started as a Facebook group and drew roughly 4 million people the day after Trump's election, now controls a network of 480 local organizers in all 50 states, tapping into more than 5,600 small groups of activists called "huddles." Indivisible, which started as an online Google doc put together by former congressional staffers, now has two groups in each Congressional district. Organizers say those Indivisible groups mobilized roughly 400,000 people to participate in at least 600 town halls to pressure their representatives on everything from immigration to Obamacare repeal. Donald Trump has blamed the US constitution for the problems he has encountered during his first 100 days in office. In an interview with Fox News to mark the milestone, the Republican called the system of checks and balances on power “archaic”. 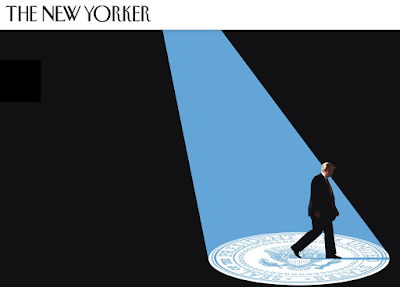 "The history of besieged Presidencies is, in the end, a history of hubris—of blindness to one’s faults, of deafness to the warnings, of seclusion from uncomfortable realities. The secret of power is not that it corrupts; that is well known. “What is never said,” Robert Caro writes, in “Master of the Senate,” about Lyndon Johnson, “is that power reveals.” Trump, after a lifetime in a family business, with no public obligations and no board of directors to please, has found himself abruptly exposed to evaluation, and his reactions have been volcanic." FULL TRANSCRIPT: President Donald Trump's interview with "Face the Nation"
Are you bummed out enough yet department. MAGA = Make America Great Again. Trump has had the worst beginning of any president since, oh, perhaps William Henry Harrison (who died a month after his inauguration). "This event is about celebrating the First Amendment and free speech. Free speech is the foundation of an open and liberal democracy from college campuses to the White House. Only in America can a first generation Indian American Muslim kid get on this stage and make fun of the President." "We have to address the elephant not in the room. The leader of our country is not here. But that's because he's in Moscow." "Even if you guys groan, I've already hired Kellyanne Conway. She's gonna go on TV Monday and tell everyone I 'killed.' It really doesn't matter." 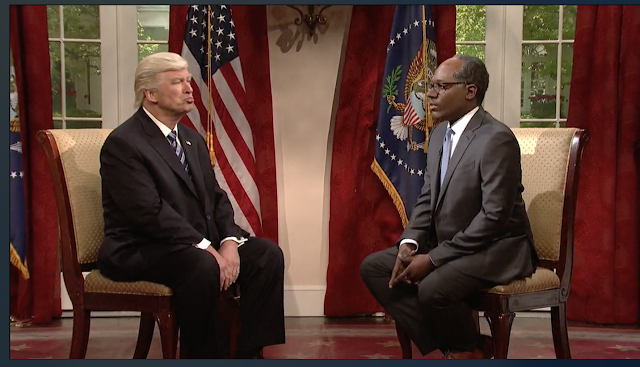 "Historically, the president usually performs at the correspondents' dinner, but I think I speak for all of us when I say he's done far too much bombing this month." 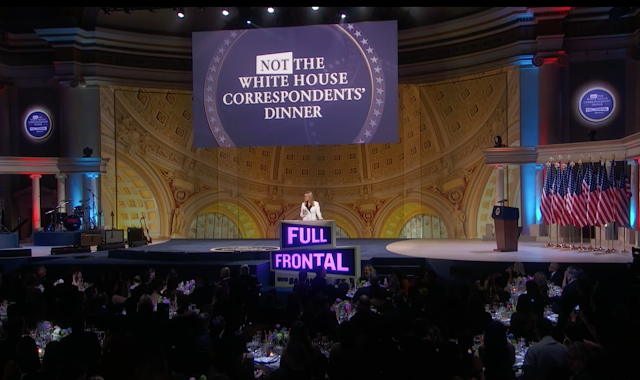 Watch Samantha Bee’s “Not the White House Correspondents Dinner here. 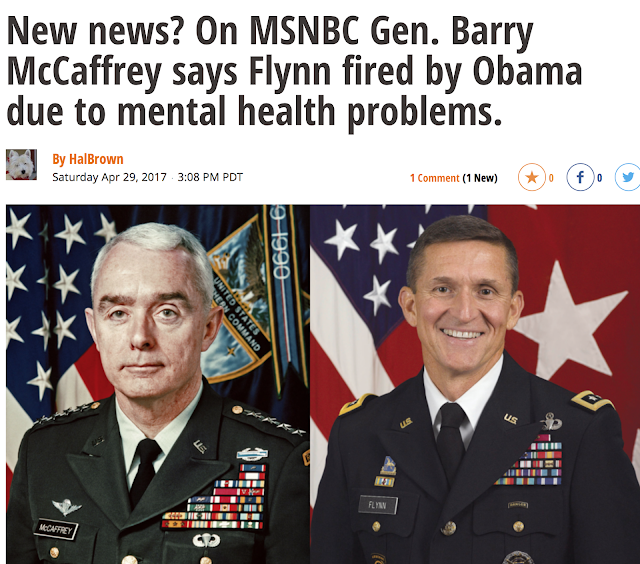 Breaking news which I just heard on MSNBC from General Barry McCaffrey, Ret., that he thinks Gen. Flynn was forced out of his Obama administration job because he had mental health problems. 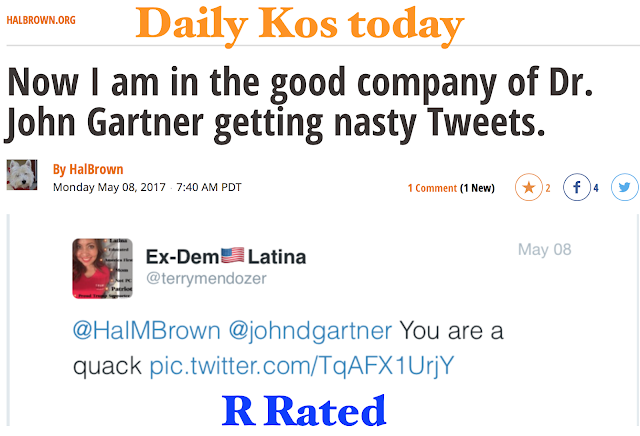 I wrote a short piece on this for Daily Kos to see if it gets any reaction. This didn’t get much coverage at the time he said it as the media was focused on Trump’s infatuation with Purin. 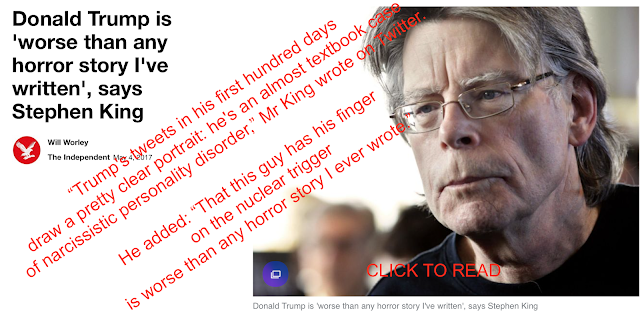 However it slices open the the dark malignant festering narcissism barely under the surface and adds to one of the other diagnoses that makes trump dangerous, psychopathic personality. A year later we discover we have a psychopathic malignant narcissist impulsive president who is ignorant of the complexities of international relations and the dire consequences of a president who thinks he knows more than his generals. 1/09/16: Republican primary front-runner Donald Trump says North Korean communist dictator Kim Jong-un deserves “credit” for the cutthroat efficiency with which he disposes of his political foes. “If you look at North Korea, this guy, he’s like a maniac, OK?” Trump said at a rally in Ottumwa, Iowa, on Saturday. 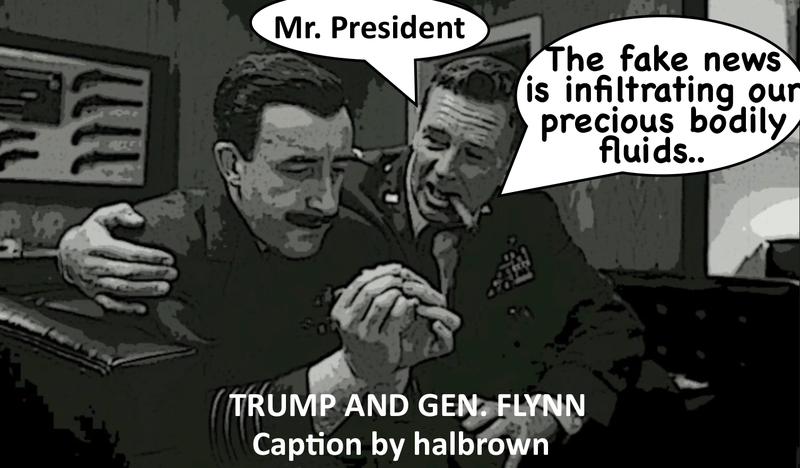 “And you’ve got to give him credit: How many young guys — he was like 26 or 25 when his father died — take over these tough generals and all of a sudden, you know, it’s pretty amazing when you think of it. How does he do that?” he added. 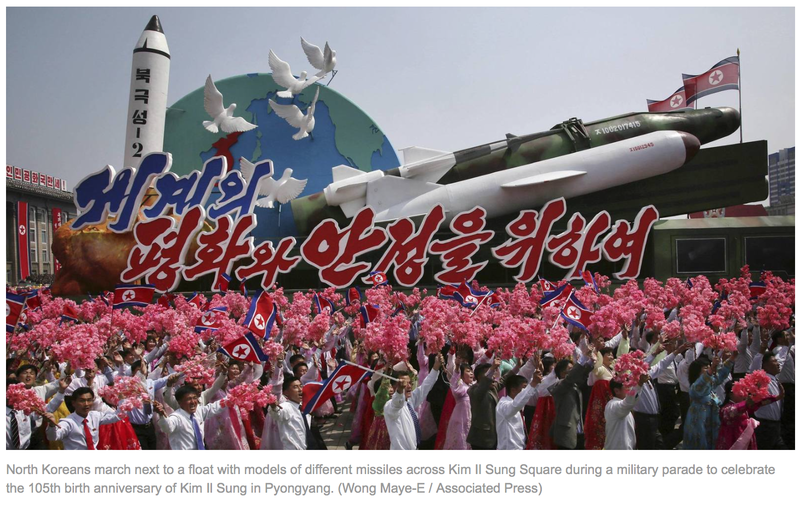 After North Korea’s government said it successfully tested a hydrogen bomb earlier this week, Trump called the authoritarian leader a “madman playing around with nukes” and a “total nut job. But he also insinuated that Kim had some admirable qualities. “I mean, it’s amazing that a young guy would go over and take over,” Trump said Thursday on Fox News’ “On the Record.” “You know, you would have thought that these tough generals would have said no way this is gonna happen when the father died.